"Heck no! We won't go!" We moved our milking herd across the road from their normal pasture this morning so they could graze in another pasture for a few hours. After lunch we begin to bring them back across the road, and at first everything seemed normal. One of our farm hands was in the pasture herding them my way, and I was standing in the road to divert them into the lane leading to the milking barn. After about half of the 187 cows had passed, I noticed that they weren't walking into the lot and were filling up the lane. By the time the last cow had crossed the road, the lane was packed full and the herd was at a complete standstill. They finally started cooperating with a little verbal encouragement and the help of a border collie, but not until I had snapped a photo (right) of what's now known as the "Occupy Farm Lane" protest. After studying over the chain of events, I think I have discovered the truth behind today's incident. I will list my conclusion below, but first allow me to share my tweets (tagged as #OccupyFarmLane) from the afternoon as things progressed. (1:51pm) BREAKING: All 187 #OccupyFarmLane dairy cows have been temporarily detained in the milking barn. Officials currently processing herd. 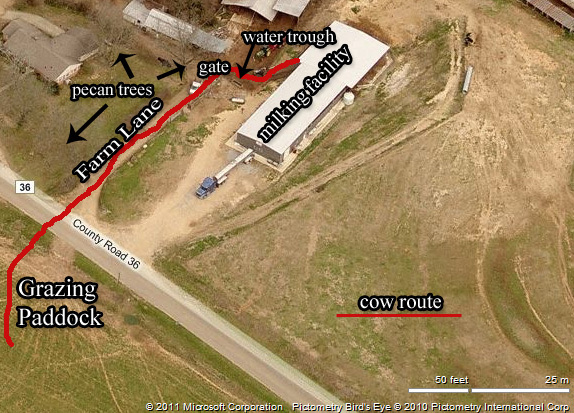 (2:20pm) BREAKING: #OccupyFarmLane cow slaps farmer in face with tail while being milked; claims she was aiming for a fly. No reprisal from farmer. (2:34pm) Says farmer Will Gilmer of #OccupyFarmLane cows' milk, "It will leave the dairy farm on Wednesday morning for pasteurization and bottling." (2:38pm) Gilmer adds that #milk from #OccupyFarmLane cows will prove to be "yummy and nutritious", posing nothing but health benefits to the public. (3:44pm) BREAKING: #OccupyFarmLane has ended. All involved dairy cows have voluntarily dispersed back to their pasture after being milked. Once we finished our normal afternoon farm duties, I launched my investigation. My first inclination was to check the maternity pasture and inquire if any dry cows' had gotten wind of the milking herd's plot. They were all eating hay and too busy to talk to me, though in all likelihood I doubt the dry cows would have said anything even if they weren't eating. I began to wonder if my cows had been infiltrated by an outside influence. I regularly read about the hijinks of Tennessee dairy farmer Ryan Bright's secret agent cows on The Udder Side, and I thought perhaps one of them had come to stir up trouble ahead of the Tennessee/Alabama football game this weekend (I like neither team, btw. Hail State!). Maybe, just maybe, it could have been a California cow trying to make sure people won't believe happy cows also live in Alabama. Since we didn't milk any extra cows over the course of the afternoon, though, I decided it must have been an inside-job. 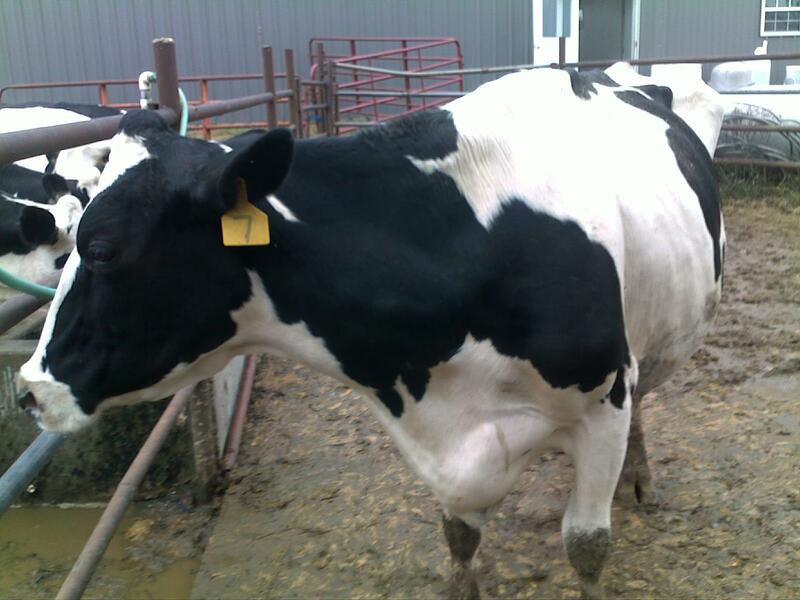 The cloud of suspicion quickly settled on our oldest, most stubborn cow, GDF#0007. This is the same cow that can send the border collies running in the other direction with nothing more than a look, and she has a long history of trying to do whatever pleases her at the time. It would be just like her to take a whim that she didn't want to be milked and lead the rest of the herd in a protest. Just as I was ready to pin all the blame on her, however, I remembered she was one of the last cows to leave the pasture this afternoon. With her now in the clear, I was left without any other viable suspects. Today was very sunny and a little bit warmer than the weather we've had recently. Before we started moving the cows across the road, I had stood underneath the big pecan tree next to the gate at the end of the lane along with my father and our farm hand. We all remarked at how easy it would be to take a nap in the shade the tree was providing. In addition to this inviting spot for man and cow alike, a water trough sits just a few feet inside the gate. This particular water trough is often the first stop for many cows on their way into the milk barn. 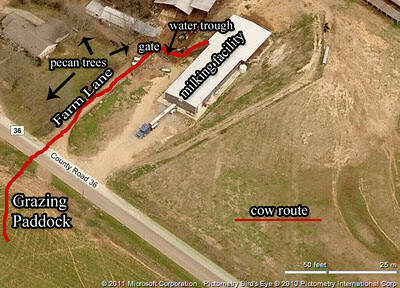 After taking everything into consideration, I think I have finally come to an accurate conclusion as to the cause of today's "Occupy Farm Lane" incident. The first 20-30 cows who came through the lane stopped to enjoy the shade and water, and did not allow the following cows to walk around them. This caused the herd to fill up the entire lane from gate to road. It wasn't a protest, it was a bovine traffic jam. There was no intention to avoiding being milked, and the integrity of the milk supply was never in danger. In other words, it was just cows being cows. 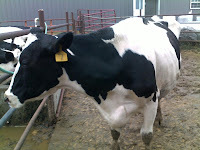 Cows have been milked on my family's dairy farm every day for over 55 years. That's over 20,000 consecutive days. We've been milking cows not just every day of my life, but of my father's as well. Over half a century worth of Christmases, Thanksgivings, Easters, Independence Days...we've milked cows. And thanks to a generator, we've milked through power outages caused by hurricanes, tornadoes, and ice storms. In other words, we've been a reliable food provider for a long, long time. What my grandfather started with just a few cows has grown into what Gilmer Dairy Farm is today: a modern, family owned and operated food production company. Our seven day a week mission isn't as simple as "making milk", though. We strive to produce a high-quality, nutrient rich food products (milk and beef) that our friends and neighbors will want to include as part of their healthy diets. There used to be dozens of small dairy farms dotted across Lamar County, but we're the only one still in operation. Our cows currently produce enough for all of our county's 14,000+ residents to enjoy a daily glass of milk, or enough to meet the "3-Every-Day" recommended servings for just over one-third of our local population. There is more than enough milk produced on other farms throughout our state and nation to serve the other 2/3s of Lamar Countians. In fact, our nation's farmers produce enough nutritious food to feed all Americans, and modern transportation and distribution systems "fill in the gaps" where the local demand exceeds the local supply. We have an abundant, affordable food supply, yet hunger is a persistent problem. And it's a problem here in Lamar County. With unemployment over 10% and 18% of our residents living below the poverty level, many of our local families are forced to decide between paying rent or putting nutritionally balanced meals on their table. While the situation is bleak, it is far from hopeless. Why? Because we can help. Today is World Food Day, and I want to challenge all Lamar Countians to do something to help combat our local hunger problem. Designate a few extra dollars in the offering plate this morning for your church's alter fund or food pantry. Donate canned goods to a church or other local food pantry, or volunteer your time to help distribute food to the needy. The West Alabama Food Bank's website lists a few other ways you can help, so I encourage you to check it out. Together, we CAN make a difference in the lives of our hungry neighbors! Harvest is finished, but there ain't no slowing down! We can finally close the book on this year's silage harvest! What started six and a half weeks ago ended Thursday with 165 acres of corn, forage sorghum, and sudex chopped, packed, and sealed into our three silage pits. I'm estimating that we harvested roughly 1400 tons of silage (it's hard to be sure w/o truck scales), which should be enough to feed our milking herd through mid-to-late spring. The corn in our first pit has now been sealed long enough to fully ensile, and I expect we'll begin feeding it late next week. We'll be getting a new grain mix formula from the feed mill based on the silage's forage analysis, and will add other home-grown forage in with it to make a total-mixed ration (TMR). We have about two weeks worth of spring oat baleage we'll use up first before switching to sudex baleage we harvested a few weeks ago. We're also going to look into using cotton hulls as a fiber source in the ration so as to preserve our bermudagrass hay for heifers and dry cows. As the feed quality improves over the next few weeks, so to should our milk production. The cooler evenings and opportunities for supplemental morning grazing will also help in that regard. We are currently up to 182 cows in milk and are on pace to climb back over the 200 mark sometime before the end of the year. In other news, we AI'ed (artificially inseminated) 9 cows this week, the first we had bred since early summer. This coming week is going to be crazy busy. In addition to the everyday dairy chores, we're going to be cleaning and putting away our harvesting equipment, applying slurry with our honeywagon, and possibly harvesting some rank pasture grass as "get-by-in-case-of-a-long-winter" hay. On top of that, some folks from our dairy checkoff will be on the farm Tuesday morning to get video footage for part of the "Dedicated to Dairy" campaign, I have a meeting at the Alabama Farmers Federation's Montgomery office on Wednesday, and then I'll be on Mississippi State's campus on Maroon Friday to give a presentation to the Ag Econ's faculty and grad students (Hail State!). I hope y'all have a "dairy" good week!